An announcement in early October 2009 by mayor Gregor Robertson has told the city that the sales for many of the high-end luxury Millennium Water Olympic Village condos will not start until next May 2010, after the Olympic Games. In an interview with the Georgia Straight, Vancouver mayor Gregor Robertson explained that the current Vancouver real estate market is still under performing, and therefore, Millennium Development Corp has decided to wait until the market gets a bit better before putting their prime waterfront Vancouver condos on sale next year. This will allow Millennium Water and the 2010 Olympic Village to gain all the media coverage and exposure during the Vancouver 2010 Winter Games, which will attract local Vancouver homebuyers, Canadians and international investors into the master planned community. In addition, because the 2010 Olympic Village is still under construction and considered a presale or pre-construction Vancouver condo purchase, many homebuyers are waiting to see what the finished product will look like, to do a walkthrough, feel and touch the finishes and features, and this will not happen until after April 2010. Therefore, the new strategy at the much anticipated waterfront Vancouver condos at Millennium Water will put sales on hold for now in this one billion dollar project. According to the marketers as well as the Mayor, many of the two hundred and sixty six (266) units that still remain unsold at the waterfront Vancouver Millennium Water condo development are of the higher end and represent multi million dollar high-end condominiums and townhomes for sale. These are in addition to the approximate seven hundred (700) Millennium Water Olympic Village condos that have already been sold to pre-construction condominium buyers. According to the latest Vancouver 2010 Olympic reports, approximately four hundred and twenty (420) Olympic Village condos have been completed, inspected, approved and now locked down by VANOC and IOC in preparation for athletes. This is almost half of the eleven hundred (1100) market units and affordable housing units available. In any case, for homebuyers looking to purchase a luxury waterfront Vancouver condo at Millennium Water, you’ll just have to wait until May 2010, before the dreaded HST hits new condominium purchases. Citing lower than anticipated market sales values in the southeast False Creek Vancouver real estate district, the developer, marketer and mayor have now confirmed that the remaining market units at the 2010 Olympic Village, also known as Millennium Water False Creek condos, will be sold next May 2010 after the Winter Games. In order to recoup the initial cash investment by the city into this master planned waterfront False Creek development, mayor Gregor Robertson has stated that the city needs a very hot real estate market to recoup some $1.2 billlion spent on building the Olympic Athlete’s Village. With the property market still realing from the global economic crisis, even with the recent upwards spike in sales volume, the sales prices of condo units around the southeast False Creek Olympic Athlete’s Village have not increased enough for the numbers to work. The Olympic Village has been under huge scrutiny due to the ballooning budget that now sits around $1.196 billion, which represents over $250 million more than the original budget of $950 million. 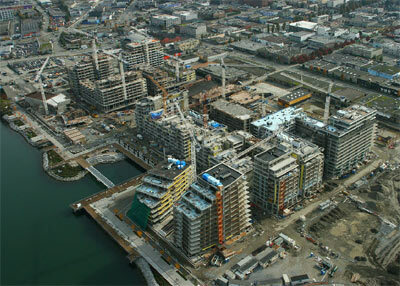 Up until October 2009, the Millennium Water condos have been quite successful in attacting Vancouver presale condo buyers. Of the 730 Millennium Water condominiums presented to the public as market units, 226 suites have been sold as pre-construction or presale Vancouver condos at the Olympic Athlete’s Village which represents more than 25%. The total sales of the presale Vancouver Millennium Water condos is priced at around $217 million. As the mayor has suggested, along with Rennie Marketing Systems, all presales will be put on hold for now until May 2010 after the increased exposure and marketing during the Olympic Winter Games. Affordable Housing at Millennium Water Olympic Athlete’s Village to be Scrapped? There are rumours around town that the Millennium Water affordable housing component of this master planned Southeast False Creek waterfront community may be scrapped due to the budget overruns and tax burden on Vancouver residents. An official has confirmed that affordable housing and homes at Millennium Water after the 2010 Games may no longer be a certainty after the latest auditor’s report came out this week. The cost of the social housing component here at Millennium Water False Creek community may be scrapped because of the costs, and the projected losses even if all the remaning units of this development are sold next year after the Olympic Games. A city report will be presented to the council later this fall as to the issue of the Millennium Water False Creek social housing component. It was originally proposed that two hundred and fifty two (252) of the eleven hundred (1100) units within the southeast False Creek Vancouver Millennium Water development be for social housing. According to the latest reports, the developer and Rennie Marketing have had lots of trouble selling these waterfront suites at market prices due to the global economic crisis. In addition, with the recent drop in Vancouver real estate prices, the city is now preparing itself for a big loss even with a sellout of all units. 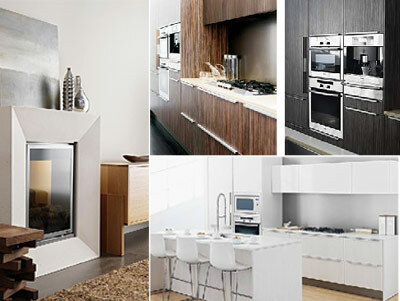 The only hope now is to keep the unsold units for after the Olympics, and then launch sales in May 2010. Will the Vancouver 2010 Olympic Village Be Ready on Time? The race is certainly on in order to keep pace with a November 1st, 2009 handover date of all condominiums to VANOC in preparation for the 2010 Vancouver Olympic Games. According to the city manager of Millennium Water Olympic Villlage, there are a couple of tight deadlines that are coming up and an update was released in a KPMG status report on the southeast False Creek Vancouver real estate development. The report that was based on details and information back in January 19th showed that Millennium Development was the lowest ranked of the three bidding Vancouver real estate developers before the price was considered, but came out on top due to the fact that they promised to deliver on time and at the best price. 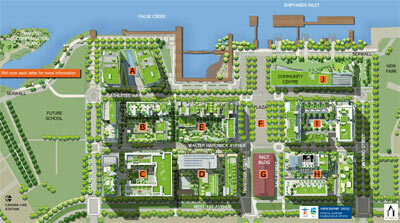 So will the Vancouver 2010 Olympic Village be ready? Well, certain things have been changed or left out from the original proposed Millennium Water False Creek development, including a triangular shaped park that was to be located next to the inlet. Another feature of the 2010 Olympic Athlete’s Village that won’t be complete until after the Winter Games will be the dock for non motor boats. Design changes to the parks, plazas, streetscapes, and other factors have already been dealt with, but according to the city manager, some of the Athlete’s Village condo buildings at Millennium Water won’t be complete before the November 1st deadline. One of the three affordable housing parcels at the Vancouver 2010 Athlete’s Village was handed over to VANOC very early, back on October 1st, 2009, another one needs monitoring and the third parcel for the affordable housing Millennium Water residential building will definitely not be ready for November 1, 2009. The expected completion of that affordable housing False Creek parcel is for December 1st. In addition, the completion of the Salt Building is still set for October 31st, but the Civic Centre that was suppose to be due for completion and handover back on July 31st, is not yet done or ready. In the entire master planned Millennium Water Vancouver 2010 Athlete’s Village, about four hundred and twenty of the eleven hundred condo units have already been completed and handed over to VANOC for final inspection.